Note: This is a guest blog from Karrieann Soto Vega, a PhD Candidate in the Composition and Cultural Rhetoric program in the Writing Studies, Rhetoric, & Composition Department, currently working as a Teaching Associate in the Women’s and Gender Studies Department at Syracuse University. Her research and pedagogical interests span decolonial feminist efforts and Puerto Rican nationalism, specifically those enacted by women; social movement rhetoric and transnational feminisms; as well as multimodality, multilingualism, and new media composition practices. At this point, the news is still highlighting how most of the archipelago has no electricity or drinking water, which has greatly affected hospitals, and the overall capacity of resuming school or work for many. Given these conditions, #PuertoRicoSeLevanta (Puerto Rico Rises) has been the most appropriate moniker for the feeling, action, and overall idea of survival after hurricane Maria ravaged Puerto Rico. A quick search of this hashtag provides a glimpse at who has been working towards the much-anticipated rising moment. A comic illustration depicting the response from the U.S. president is juxtaposed to several people lifting a figure of a saddened map of Puerto Rico. The people holding up Puerto Rico are wearing shirts that name them: Diaspora, Artistas, Gobierno, Pueblo, and even a person wearing military gear. To me, this comic represents the narratives I’ve been hearing since September 20th. The Puerto Rican diaspora has been organizing relief efforts and sending donations collected on the continental U.S., forming what I call networks of solidarity all over the world. 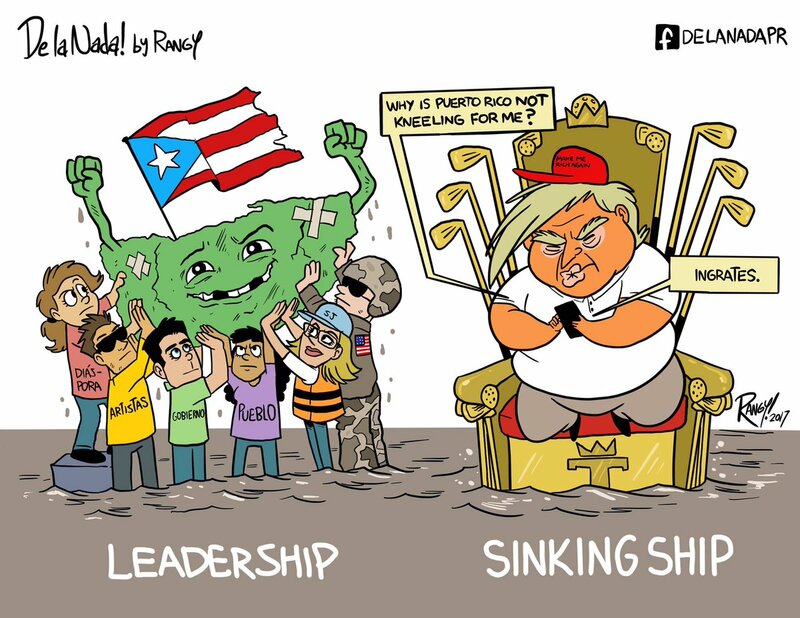 Artists like Lin Manuel Miranda and Olympic Gold Medal winner, Monica Puig, and the local government officials in Puerto Rico are also doing all they can to help their fellow Puerto Rican people, the Puerto Rican “pueblo.” Missing from this comic, and the narrative it represents, is a set of grassroots, Puerto Rican organizations that had already been working to uplift Puerto Rico from the decaying conditions caused by the well-publicized debt. This image is especially effective in portraying the negative response of the U.S. government. Missing from the image are the exact tweets where the president characterizes Puerto Ricans as lazy, people who expect everything to be done for them. These tweets are tinted with neocolonial undertones. Not only are “they” (not us) lazy, but they are not doing anything to survive. This is an outright lie. It is important to recognize the work that a large number of Puerto Ricans have been doing to uplift the culture and economy of the archipelago well before hurricane María. This recognition helps to counter the claims of Puerto Ricans being unable to do anything for themselves, and that the only way for them to do anything is through U.S. intervention, because white savior complex. Don’t get me wrong, the U.S. government must provide all of the help and support it can spare (which apparently is not that much), and it should do so especially because of the political relationship they share. In an ideal world, aid efforts would be coordinated with local organizations instead of sporadically providing crumbs in the form of Pringles and water bottles, as David Begnaud reported was the case in Aguadilla. Under extremely terrible conditions, Puerto Ricans have been looking out for each other, helping each other open up roads, and feeding one another. These are the stories I believe we should highlight. There are several groups who have been advocating for Puerto Ricans from within the Caribbean context. The group Defend Puerto Rico, for example, has been recently calling for Puerto Ricans in the diaspora to urge Congress to act to increase the moneys allotted for Puerto Rico relief. But before the hurricane, Defend Puerto Rico had been creating connections with the New York Diaspora, to creatively celebrate Puerto Rican traditions. They also documented the efforts of the brave women in Peñuelas who are fighting the corporations dumping toxic coal ash in Tallaboa by using their bodies to blockade trucks carrying the ashes and doing outreach to educate el pueblo: creating a women-led environmental justice movement. A collective of grassroots organizations is now called the Hurricane Maria Relief Fund, and it is accepting donations that will go to organizations like Taller Salud in Loíza, the G8 of Caño Martin Peña in San Juan, and the Centro para Desarrollo Político, Educativo, y Cultural in Caguas. Each of these organizations have had their own political project, whether to provide affordable and holistic healing to impoverished communities or to create programs for the political, educational, and cultural development of Puerto Rican communities. The best way to help Puerto Rico is by giving to Puerto Ricans who are already doing the work. Though I’ve only provided a few examples (also check out ConPRmetidos), these organizations represent a collective of groups who are trying to rebuild Puerto Rico, their way.